Huddersfield Town boss Simon Grayson is not ruling out a move for Leicester City striker Jermaine Beckford when the loan window re-opens on Friday. The Terriers looked set to bring in the 28-year-old before the Foxes changed their mind about the deal shortly before the transfer window closed. "It took a lot of hard work and desire and we almost had it over the line," he told BBC Radio Leeds. "He wanted to come and we might re-visit it in a few weeks time." Grayson added: "We're in the hands of the other football club but Jermaine is a player I know well and I like." 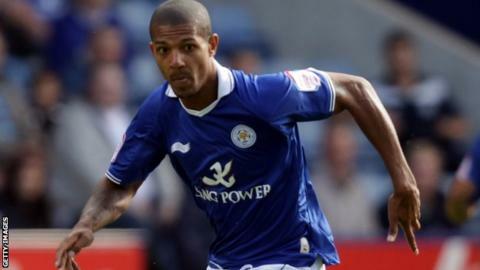 Beckford, who played under Grayson at Leeds United, came on as a late substitite in Leicester's win over Blackpool on Saturday. Huddersfield sold striker Jordan Rhodes to Blackburn for £8m on Thursday but were unable to bring in a replacement in time for Saturday's match at Ipswich. The Terriers recorded a 2-2 draw at Portman Road and Grayson was pleased by the performance of loan signing James Vaughan. Vaughan, 24, on a season-long loan from Norwich City, scored his first goal for the club but also missed a late penalty. "He was a real handful and that was why I brought him to the club," Grayson continued. "I'm delighted with him getting his goal and obviously he could have had a couple more."